1. First you need to scan your site. If you don't already have a configuration for your site, at the Sites screen, press the + button and type your starting url. 3. 'Change frequency' indicates to Google how often you feel that you update your pages. 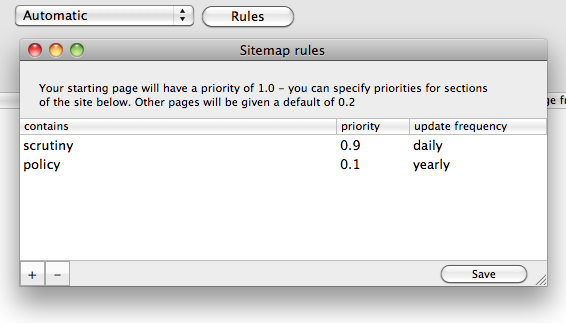 This doesn't oblige them to crawl your site any more or less regularly. If you generally update your pages more regularly or less regularly than weekly, you might like to change the default setting and press 'Update all'. 4. 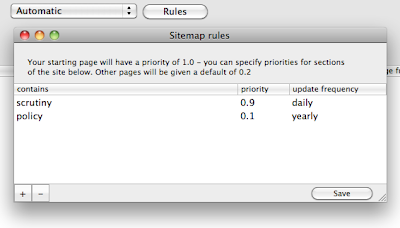 For more specific control, you can set up some 'rules' to specify priority and update frequency for certain pages or sections of your site. You don't need to enter a full url - like the black and white lists on the front settings screen, you only need to enter a partial url. This way it is possible to specify a particular url or a section of the site, eg "/engineering/"
5. When you're ready, go to Export > XML and choose where you save the sitemap file. 6. See the search engine's own help for details of how to submit your sitemap.